Line a 24cm round, 7cm high springform pan with baking paper, ensuring the paper extends 2cm above the top. Add biscuits and desiccated coconut to a food processor and whizz to resemble a fine crumb. With the mixer running, add the melted Liddells lactose free dairy spread and process until well combined. Empty mixture into the prepared pan and use the back of a metal spoon to press it evenly across the bottom. Refrigerate while the filling is prepared. Place the boiling water in a small bowl. Sprinkle over gelatine and whisk with a fork until completely dissolved. Set aside for 5 mins to cool. 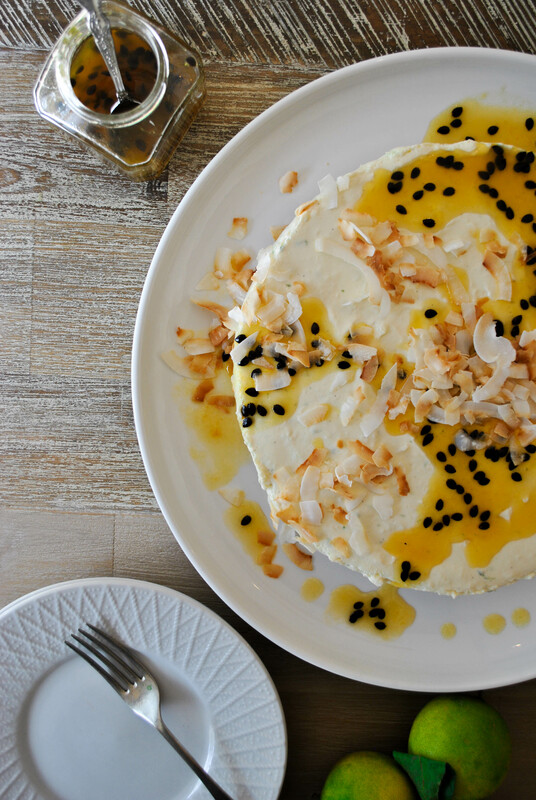 Place Liddells lactose free cream cheese, coconut essence, vanilla bean paste, caster sugar and lime zest into a large mixing bowl and use an electric mixer to beat for 5 minutes, or until light and fluffy. Add Liddells lactose free lite thickened cream and coconut cream and beat for a further 2 minutes until all is well combined. With the motor running, gradually add the gelatine mixture, beating until just smooth. Pour the cream mixture over the biscuit base and refrigerate overnight. 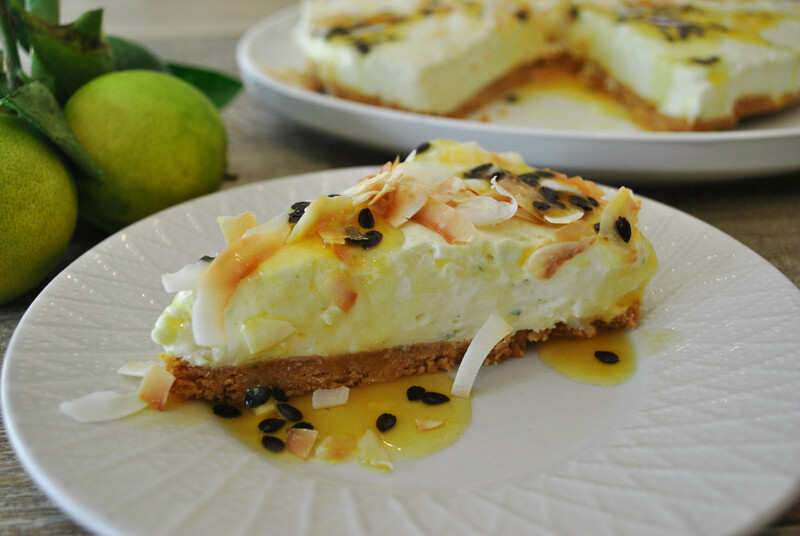 To make the syrup – place passionfruit pulp, lime juice and sugar into a smallsaucepan over a medium heat. Allow to come to a simmer for 5 minutes, stirring occasionally, or until the sauce begins to slightly thicken. Once cooked, remove from heat and allow to fully cool. Remove the sides from the springform pan and use a spatula to carefully separate the cheesecake from the base of the pan. 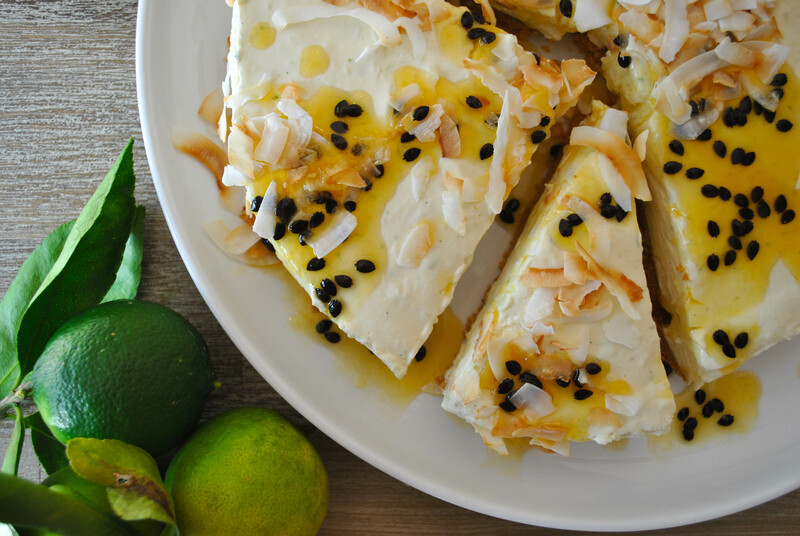 Serve the cheesecake toppedwith lime and passionfruit syrup, and toasted shaved coconut. This Cheesecake looks so yummy!! !I can’t wait to try it! …Thanks for the recipe.